Though the blockchain is set to disrupt business processes, governance systems, and value exchange, no sector gets scared by the mention of this technology more than the banking and finance industries. Barely 10 years old, the distributed ledger technology that powers cryptocurrencies has shown how it can disrupt banking architecture, create faster and cheaper global trading gateways and eliminate third parties in many industries – making the traditional system seem archaic. But the banking and finance industry isn’t sitting idle either. As Stewart Brand puts it, “once a new technology rolls over you, if you’re not part of the steamroller, you’re part of the road.” Banks have joined the blockchain bandwagon to explore use cases that will keep their financial operations relevant. But as these banks embrace blockchain, the future of banking, finance, and fintech lie mostly in the hands of new distributed ledger technology startups that are leveraging existing financial infrastructure to create cutting-edge, decentralized financial systems. Think of these startups as the new SWIFTs, VISAs, and future banks. At the center of this future banking industry are two important organizations, Stellar and Ripple. These two blockchain companies are focused on merging distributed ledger technologies with available financial architecture. Hailed as the “future of banking and finance”, these firms are creating blockchain-based solutions for the current problems that the industry faces. Buy Stellar Lumens (XLM) ! 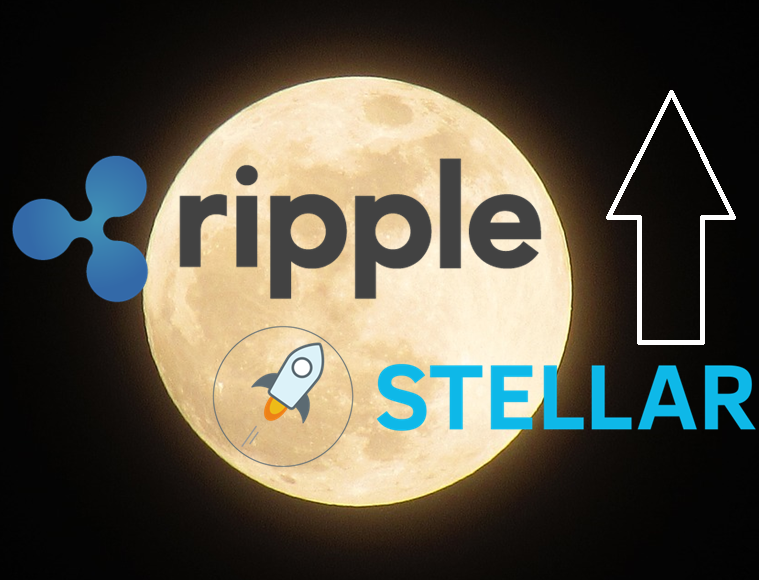 Incorporated in 2014, Stellar is a blockchain platform that hopes to provide financial solutions for everyone, everywhere. Among its core tenets are the advancement of global financial literacy, inclusion, and access by offering borderless, low-cost, and peer-to-peer financial solutions. As an organization that hinges on the distributed ledger technology, one would think Stellar’s disruptive moves would put traditional banks out of business. But that’s not what is happening. The Delaware-based company is instead leaning towards the traditional banking and finance systems, and instead of reinventing the wheel entirely, it is collaborating with existing banks to achieve its goals. At the 2016 Exponential Finance conference in Johannesburg South Africa, CEO of corporate and investment banking at Barclays Africa Stephen van Coller talked about how the financial giant is piloting a distributed ledger solution using Stellar’s payments rails. The pilot program, involving students between the ages of 16 and 18 aims to culminate research into how mobile phones can serve as everyday payment systems for the growing African population. That, however, was just the beginning of Stellar’s journey into traditional banking and finance. Stellar partnered with IBM in October 2017 to develop the Blockchain World Wire (BWW), a distributed ledger solution for interbank transfers and low-fee global payment systems. Since its launch, BWW has been considered by some industry pundits to be a SWIFT replacement in the global payment landscape. Through the Deloitte Digital Bank, Stellar also partnered with the professional services giant to build a state-of-the-art, low-cost banking system for the financial industry. But that was just a tip of the iceberg. What cemented Stellar’s place as a blockchain organization moving into traditional banking was its acquisition of Chain, a San-Francisco based blockchain startup building distributed ledger technology solutions for the financial industry. What makes this acquisition a big deal is that Chain isn’t your usual blockchain startup. Apart from its strong presence in this industry in just a couple of years, Chain has very strong investors, including Citi Ventures, Visa, and Nasdaq. Together with the for-profit arm of the Stellar Development Foundation, Chain is now Interstellar. Stellar has a broader aim of building low-cost, high-performing, and modernized financial solutions both for individuals and businesses. Instead of reinventing the wheel through decentralization, Stellar’s moves are toward using existing financial systems to create decentralized solutions that fit the needs of today’s modern consumer. But Stellar is not the only startup heading along this path. When it kicked off in 2013, Ripple’s main aim was to build scalable and cheaper financial processing solutions for banks around the globe, and by 2014, the blockchain startup had already gained Fidor Bank as its first client. The Munich-based bank implemented Ripple’s payment processing system for its local and international customers. The Ripple Foundation has since been collaborating with financial authorities and banks around the world to revolutionize the industry. Ripple has swept across the Arab world where it signed an international payment deal with UAE Exchange for decentralized cross-border payment solutions. The Saudi Arabia Monetary Authority, the Kingdom’s central bank, has also signed an agreement with Ripple to allow domestic banks to beef up their local and international payment processing capacities using xCurrent, Ripple’s blockchain-based, low cost, and transparent settlement solution. Ripple’s journey into the financial industry cut across every part of the world. In November this year, the blockchain-based startup partnered with one of the biggest Banks in Brazil, Bradesco. The partnership allows the bank to carry out seamless financial transactions across its 5,300+ branches and over 38,000 ATMs. The deal also brings on board the Brazil-Japan cross-border payment corridor, with big names such as Mitsubishi and MUFG joining the pact. Earlier on in October, a consortium of 60 Japanese banks which control over 80% of banking assets in Japan signed on to Ripple’s MoneyTap. On a wider scale, Ripple has already been tagged as the blockchain technology slowly overtaking SWIFT and Visa, and the company’s fast adoption by existing financial institutions only proves the point. By the end of 2017, Ripple had over 75 banks using its various distributed ledger solutions. Other notable banks using Ripple include PNC Bank, IndusInd Bank, Banco Santander, BBVA, Akbank, Standard Chartered, and Bank of America among others. The San Francisco-based startup has built and continues to build blockchain solutions for banks across the globe, and if this momentum continues, Ripple is poised to become the future SWIFT. Money is changing, value exchange has also changed, and asset digitization is gradually taking center stage. In such a disruptive market, what would the future bank or financial system look like?